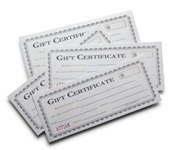 Our gift certificates are available in any denomination. They can be used to purchase supplements, naturopathic services, or a combination of both supplements and services. You may redeem them online or at our office. We will notify the lucky recipient by email or by mail at no extra cost. You will be able to choose which method you prefer after you select "Add to Cart" below.